This weekend I judged two days at the PAX Prime convention. PAX is a hybrid RPG and Video Game convention created by the Penny Arcade guys. It packs some 70,000 gamers and this year it really grew to bring more attention to RPGs and D&D. I ran the Dark Sun Arena, judging continuously from 11Am to 11PM two days in a row with just one break (to play Ravenloft) and one slot where I judged Gamma World. It was as fun as it was exhausting. My thanks to the players at my tables and the great camaraderie from fellow judges. The D&D area was very well-run. So, having played and looked through all this swag, here are some quick takes on the new products. I won’t normally make it a point to review stuff, but because some of these products are not out yet and since I did get some special opportunities to review some items, I will break from my Dark Sun blogs to do these reviews. This is a very easy one to review. For $20 you get 10 sheets of double-sided tiles. The tiles are almost entirely from previous sets (I saw one or two that seemed to be modified or new) and are of the same style and quality as previous tile sets. The tiles come inside a large box that holds these tiles and could hold other tiles (either in their original frames or loose – I store mine back in the frames when done and keep them on my bookshelf). You can probably store about 2-3 more sets in the box if you kept everything in frames. The idea of providing the storage box is very cool, and I hope future master sets do the same. A fantastically cool aspect is that the box itself has a 12×9 floor tile pattern! This means the box lid and underside each are a useful surface for playing. And, the edges are decorated to look like the dungeon walls from Harrowing Halls (with images of wall bricks and stone pillars), so you could use one or both as elevated platforms! The lid is actually one square high and the box bottom is two squares high – absolutely genius! The person at WotC that came up with that needs a raise immediately. The tiles themselves are a good selection across many sets. Even though I have two copies of almost every tiles set, this is a good addition to my set. And, at $20 I find the price very reasonable as a way to get some good tiles. I think this is a fantastic product. The Rules Compendium is a very attractive 6″x9″ 319-page mini-book containing rules for 4E. The rules of course include the various errata, but also are written in a slightly different style which is often a substantial improvement over the original source. Rules often have new diagrams and play examples. As an example, one of my big pet peeves with 4E is how stealth has been written up over time, leading to massive confusion on how stealth works (even amongst WotC staff). The Stealth rules in this book are much better in wording and the example of play is a very cleverly chosen one that really explains how hiding works. The same is true of Charging. The book is surprisingly comprehensive, covering all sorts of topics. It includes information on deities, on campaign worlds, on leveling up, etc. Individual powers or magic items are not covered, but topics like weapons as implements and understanding powers are covered. The magic item rarity rules are covered but in no more detail than has already been previewed. I can see a new gamer buying this and DDI and being in really good shape. I can see judges buying this to have as a portable reference and to help new players understand the rules. I am not sure if most experienced players (that do not judge) really need it, but it might be of value to them as well. All-in-all, I can recommend this item. I would not have expected this, but it really has been written well enough that I might bring it along with me to gamedays so that I can show players both rules text and the examples. It is a strong piece of work and I consider it a good product. For a new player, it could be an excellent product. This is a cooperative board game using very simplified core 4E rules and a narrow set of options (though more than sufficient for a fun board game). The Ravenloft board game is in the style of Pandemic and similar games where all players seek to accomplish the same thing together and thus must discuss how best to tackle what is thrown at them. On their turn they both choose actions and trigger changes in the game. Many of my friends have been critical of WotC focusing on board games. However, Wizards of the Coast is historically a gaming company focusing on non-RPG games. Richard Garfield pitched Robo-Rally to them before then showing them Magic the Gathering, for example. 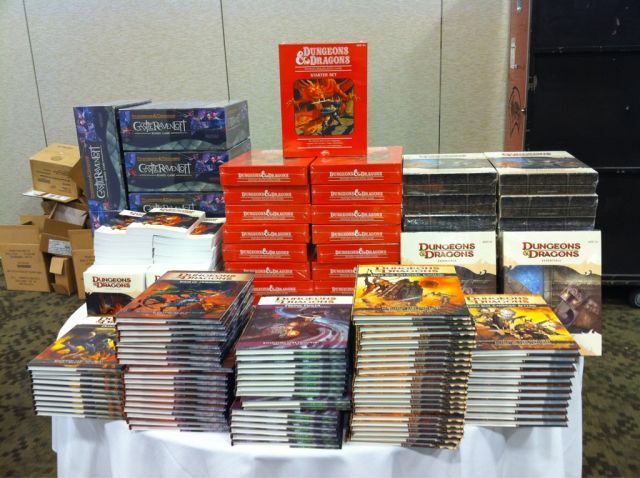 What is different is that the D&D teams are now looking to support board games and board game/RPG hybrids, and that can worry some that the devotion to a good RPG game will waver or that the board game side will be weak. When it comes to the board game side, Ravenloft is a very good offering. At a very high level, players take turns moving and/or attacking, uncovering a new tile if they choose to explore, triggering a monster or an event or both, and then activating any monsters they control. Monsters have instructions on how to run them so a player ends up controlling them fairly. Magic items and PC powers add good variety and interesting options. You choose your PC powers, which is fun, using traditional At-Will and one-use options. My buddy Jeremiah and I had an awesome time playing at PAX. We added a layer of role-play for fun (we had the table rolling on the floor at times with our antics) and really enjoyed the tactical angle, the gameplay, and the challenge level. Between the tiles and the events and the monsters all being random you get a varied experience. We had some fairly new-to-D&D players at our table and that did not hurt their ability to play. In fact, this is an excellent “gateway drug” to get non-D&D players to want to try D&D. I will absolutely play this game with my non-gamer adult couples-night board game group and I think it could cause one of them to want to play D&D. It is low on geeky and high on playability. Unlike what Jester concluded, I am very positive on how it plays for casual gamers and experienced gamers alike. He is right that it isn’t so much a Ravenloft product as a game with some basis on Ravenloft. It is also not an RPG and does not evoke RP (though you can choose to do so). It is an impressive offering. I do recommend this game highly and consider it an excellent game. That being said, Pandemic is a better buy if you don’t care about the D&D connection. This is a really interesting product. Unlike Ravenloft, GW is not a board game. This really is an RPG – though a very light and confined one. Gamma World is not a CCG. What WotC has been saying is true – Gamma World plays best when you don’t collect the cards. More on this later. Let’s go back and look at the product. For $40 you get a large box with a small-footprint but well made (and very pretty) 159-page rulebook. The rulebook is well written and does a great job of walking you through character creation, gameplay, and things like available monsters. You get what could be called a “starter deck” of well-made CCG-style cards. The 80 cards are half Alpha mutations and half Omega technology items (more on that later). You get two sheets of well-made tokens which contain different images on each side of the monster tokens so that you can use a wider variety of monsters (though this means you can’t run certain combinations). You get two double-sided poster maps (similar look to D&D Tiles but made of thin poster paper). You get one booster of Alpha and Omega cards. The game is a campy sci-fi RPG where the world went crazy thanks to the Hadron Super-Collider. Alternate time-lines of AI robots, aliens, Armageddon, and other wacky stuff all merge into our world. You end up in a post-apocalyptic future setting with a lot of humor because the players know things the PCs do not. For example, the PAX adventure was based in Seattle, but the PCs did not know this (and would not understand the name). A postcard with the Space Needle and the words “Greetings from Seatt” were a hint to the players. PC generation is extremely fast – you end up with funny combinations of origins such as Cockroach Empath. Each provides skills you are trained in, powers you can use (sometimes Encounter, sometimes At-Will), and other cool but short features. A friend of mine made cut-out cards and this is a good way for players to track their Origins. You then assign abilities based on the origins and finally roll the rest randomly. You quickly calculate a few numbers for skills and attacks, choose weapons, and roll for gear (giving you funny things like a canoe and a wagon). You also get an initial Alpha Mutation. One of the card types, this is a strange short-lived mutation. The power of these varies widely. One PC might be able to do a blast 5 that stuns creatures, save ends. Another might get tentacles that let you draw or sheathe items as a free action. Many of the Alpha Mutations have an “Overcharge” option, where you can roll a die and see if something cool (make basic attack with tentacles as a minor action) or bad (tentacles decide to strangle you and you are stunned save ends) happens. You discard Alpha cards at the end of each encounter and then draw new ones. The wide variety is part of what makes this not worth collecting. They play best if you are surprised by what you get rather than players making a super-deck and knowing all the cards. The option to use the GM’s deck helps this, as well as buying a periodic pack. In this regard, I see boosters as a board game style add-on that can help keep the game fresh. When you explore you might find random ancient junk (stuff from our world). This can include a car stereo, inflatable kiddie pool, or smoke alarm. This can be a ton of fun. When the young boy at the table I DMed hooked up the car stereo to his power generator and played 80’s music… well, let’s just say he did very well with the Dancebot 1986 robot. And when a player asked if he could use his foosball table as a weapon… who was I to say no? A friend made some awesome random junk cards, which I will post once the game releases. The setting seems ideal for short campaigns and periodic adventure settings. The rules may be somewhat limited if you tried to do a protracted campaign. A game like Eclipse Phase would be better, especially if you want serious sci-fi instead of a humorous setting. Overall, this is a fun game and worthy of your gaming shelf. I think it is a very good product. Edit: Read about Wil Wheaton’s celebrity GW game and see what author Logan Bonner came up with for a character image! Trying to figure out Essentials has been its own mini game for most gamers. The Red Box sells for an incredibly reasonable $20 and comes with two short books, token sheet, black dice, a poster map using images from Dungeon Tiles, character sheets, and some power cards. The tokens are well made. The power cards are a bit thin and are not poly-coated like previous power card offerings. The character sheets are a slightly different format, breaking up skills amongst abilities, for example. The Player’s Book is fantastic. It uses a choose-your-own adventure format to help players make decisions and guide them in ending up with a PC that meets their style. The DM’s Book is also done in a new style, working through encounters and not delving deeply into DM topics or doing so as they come up. For example, the skill challenge system is explained as part of the skill challenge encounter. After 7 encounters there is information on making your own and additional monsters. The boxed set seems like a good offering for a new person that wants to learn about the game and help them get started with the game. For example, an interested player might buy the box, then talk their friends into playing with them. It does not really cater to the existing player. For example, other than the power cards, there is no place that gathers the powers in a way an existing player could skim them and see what they want to take. Nor are the class features explained in a traditional PH format. A DM will not find an encyclopedia-style covering of terrain or how to create encounters. These things would be presumably found in other Essentials offerings. I find it very hard to evaluate this product. I have little personal need for it. The power cards, dice, and tokens are of no value to me whatsoever. The two books are really angled toward very new players. In comparing this to the many previous boxed sets I have seen over the ages (the OD&D Purple Box I started with, original Red Box, Basic Game for 3E, etc.) there are some nice innovations. It is a sound purchase as a way to get into the game. However, it is not a good replacement or even supplement for anyone with actual experience. Once you get some experience I am not sure there is much value. I have seen the DM’s Kit box at my local flagship gaming store, and I feel the same way about that set. There are some nice innovations but it seems to be best for a fairly confined demographic. I find the 3E Basic Game box to be of greater value to all demographics and I wonder if these two Essentials Offerings could have been made so they were more widely appealing. If the Red Box had real minis, real tiles, and offered something like an innovative power sheet, then it would be much closer to a must-have for everyone. Edit: Picture of all components by DMSamuel! I see some excellent innovation from WotC. The new offering show some really different thinking within Wizards and these products are by and large excellent purchases. The future seems very bright to me and I clearly need to judge big conventions until I keel over (hopefully due to age and not exhaustion). This entry was posted on October 2, 2015 by Alphastream and tagged 4E, Gamma World, Starter Set.